The possibility of a bright future paves way for the effort we put to shape ourselves today. If the goal is to be ready for future, one needs to adapt to the futuristic way of learning as well. We live in an era where everything is “out of mind once out of sight”, this means we need to be innovative in how we learn and how we impart learnings. So as a trainer it is our responsibility to keep finding new ways of engaging people in our trainings. One effective method of doing so is through microlearning. But what is micro learning? 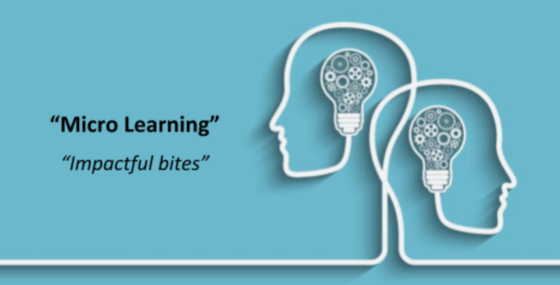 Microlearning is the way of passing knowledge or learnings through short-term lessons, a small module of LMS (Learning management system) or sometimes divided into small segments to address the more receptive audience. In the times we live in, we are growing into people with limited attention span. We are flooded with content which comes and goes in a blink of an eye, so sharing knowledge in bulk is not an impactful method. It only results in wastage of energy and resources, and so its imperative to find a way to counter these challenges, and traditional ways are not going to be a solution for it. If we talk about the corporate world in particular then we see the need of shifting from traditional classroom way of training to more advanced and impactful methodologies. Microlearning is one of the most accredited ways of achieving this. We see across industries that to accommodate and address the needs of various individuals in an organization, most of these practices are followed. But while implementing the importance of microlearning is often neglected. Instead of dividing larger content into bites or segments, the focus limits on sending content to the audience without analyzing if it will be consumed or not. As a result, the audience is left confused with the information shared. To top it all a lot of content is shared which people are unable to relate with. They don’t know how, when & where it will be used. On topics like the ones mentioned below, microlearning format can create larger impact & prolonged retention. Experts around the globe believe that due to the increasing demand of people in the workforce and rapidly changing market situations microlearning will be soon amongst one of the top training methodologies. It comes with a huge advantage of saving precious work hours. As Kovachev, Dejan & Cao, Yiwei & Klamma, Ralf & Jarke, Matthias say in their research paper “Learn-as-you-go: New Ways of Cloud-Based Micro-learning for the Mobile”, Microlearning has a great potential to serve mobile users, as micro-content goes where the learner goes. No doubt macro learning is equally needed but for example, if you need to remind people about facts and numbers or update them about existing guidelines or product update is to be shared then microlearning is impactful, but for introducing a totally new concept, macro learning methodologies serve the purpose better. In the end, I believe it is important to understand that micro learning can be an impactful alternative when a tiny amount of information or knowledge is to be shared. The traditional method of macro methodologies is very much needed but coupled with microlearning they can impart learning that lasts.